IFM Trade is an online brokerage company, based in Sydney, Australia. It was founded back in 2012 and it is regulated by ASIC, the most important financial regulator from Australia. IFM Trade is driven by industry specialists who have worked in some of the biggest financial institutions in the world and they have managed to bring all the best practices under one roof. IFM Trade offers institutional level trading conditions and high quality services. They focus on executing trades by applying brand new technologies and implementing new opportunities that help customers to grow. The Standard account looks like the best suited, offering the widest variety of trading instruments, including 10 CFDs for crypto currencies. IFM Trade managed to develop a wide variety of trading platforms. Their main platform is the metatrader 4, the most popular forex trading platform. With it, traders can enjoy trading more than 470 instruments, low spreads, full EA functionality, multiple chart types and hedging possibilities. IFM Trade has a mobile version of mt4, compatible with android and iOS devices. It is a 100% native application, it has multiple technical indicators and full trading history journal. 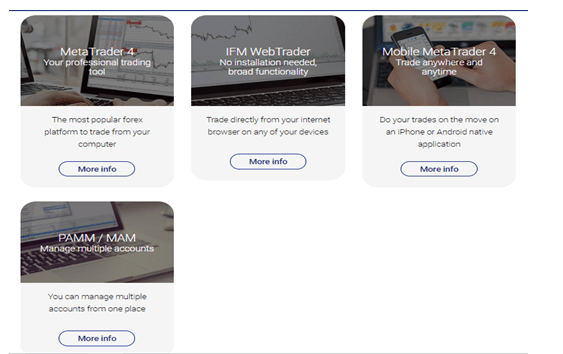 The IFM Webtrader is a proprietary trading platform developed for traders who want direct access to their trading account from an internet browser. It has a broad trading functionality and works across multiple operating systems, including Windows, MAC OSX, Linux and all mobile OS. IFM Trade representatives could be reached via email, phone or skype from Monday to Friday. Unfortunately, they do not have live chat support, but skype support is also a good alternative. Summary: IFM Trade is an online brokerage company, based in Sydney, Australia. It was founded back in 2012 and it is regulated by ASIC, the most important financial regulator from Australia. IFM Trade is driven by industry specialists who have worked in some of the biggest financial institutions in the world and they have managed to bring all the best practices under one roof.